If you suspect a swimming pool leak, take action now. Don't continue to refill your pool, wasting water and money. Choose the right company to solve your pool problems. 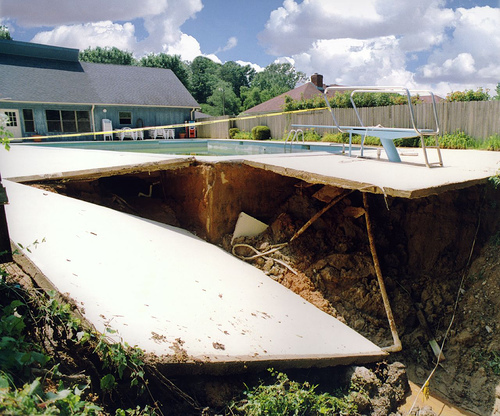 Studies have shown 1 in 20 pools in the US are currently losing water caused by an undetected leak. Many homeowners turn to their pool professionals when they suspect a swimming pool leak, but our expert technicians utilize state of the art technology to detect problems without using the search and destroy method. American Leak Detection specializes in swimming pools and spas, concealed plumbing and drain lines and detecting the cause and origin of mystery leaks. We are the recognized world leader in non-invasive leak detection. Start saving money, your property and resources now. Call us today to learn more. Swimming pool structure test - We test your pool’s structure for leaking with a visual inspection by diving into the pool. Swimming pool plumbing test - We isolate your plumbing system and pressure test the plumbing in each line to verify that each pipe is leak free. Before having a leak detection performed, verify your rate of water loss. Use the bucket test and the water loss calculator to determine your rate of water loss. Before the leak specialist arrives to perform the leak detection, your pool should be clean and clear, at the normal full level. Cloudy water is a sign of bacterial infestation and the pool should not be entered by anyone. How many pumps and skimmers does the pool have? Is a spa or water feature attached? What are the construction materials? Gunite, vinyl, fiberglass, pebbletech, or above-ground? What is your pool's chemical system? Chlorine or salt-water system? Is there an auto-fill system? Is there an automatic cleaning system? If so, what kind? How many light fixtures are in the pool or spa? Concrete/gunite, vinyl, and fiberglass are the three main types of in-ground swimming pool materials. Each is vulnerable to different forms of leaks and requires various methods to repair. We also offer a Crack inspection process for structural repairs. Leaks found in the pool’s plumbing lines are most often due to corrosion or ground movement. Our experienced professionals routinely find and repair leaks in the pool’s plumbing system. The mission of American Leak Detection is to find leaks in a manner that is non-invasive, efficient and environmentally sound. We will give prompt, professional and courteous service to all customers, while providing the best leak detection services in the world.